West Indies lost against Ireland in the opening world cup game and it was kind of expected with so much going on behind the scenes for West Indies team management and players, but boy did they turn it around against Pakistan in their second world cup game winning the match by 150 runs. 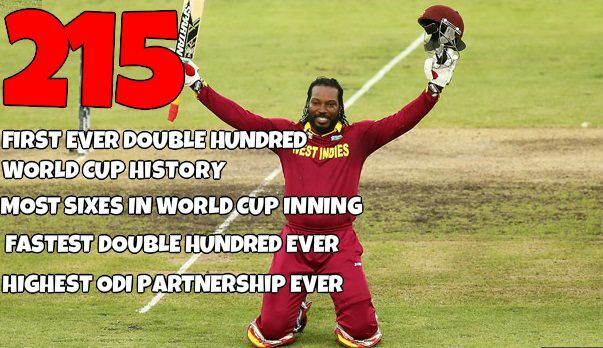 Today West Indies played their third match against Zimbabwe and Chris Gayle was at his brilliant best scoring his first double hundred in ODI cricket and broke quite a few records in process beating Zimbabwe and getting West Indies world cup campaign back on track. Although this is the first ever double century in ODI cricket world cup history but its the 5th overall in ODI cricket, before Chris Gayle, Sachin Tendulkar, Virender Sehwag and Rohit Sharma has done it twice. Here are all the videos of other 4 double hundred. Just like his idol Tendulkar, Virendra Sehwag went onto achieve the double century mark in ODI match against West Indies. Here is the short video of the innings which was at the time highest individual score by any batsman in ODI cricket. Rohit Sharma became the third batsman in history of cricket to score a double hundred in ODI cricket and he was third from India as well. Here is his record breaking inning back in November 2013. Rohit Sharma became the first batsman to score double hundred in ODI cricket twice and first to cross 250 runs in an ODI inning. Most sixes in and ODI innings (16) and highest individual score of 264 in one inning. here is the video of the inning.